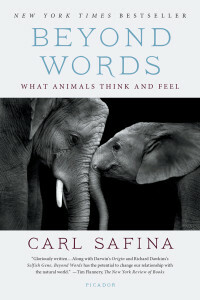 Beyond Words: What Animals Think and Feel was published to rave reviews in 2015. Now in trade paperback format, it has lost none of its impact and thoughtful examination of what goes through the minds of animals. It reminds us that humans are also animals, and of the convincing parallels between species. Safina posits that the boundary between animals and humans is not as concrete as it may seem: “the different species are like people who knew each other in high school but have since gone on to different lives and livelihoods. Lots in common. Common roots.” In the 17th Century Voltaire wrote, “What a pitiful, what a sorry thing to have said that animals are machines bereft of understanding and feeling.” He went on to cite examples of dog behavior that clearly supported his point. Scientists question whether animals have a “theory of mind,” which according to Naomi Chedd means “knowing that another can have thoughts that differ from yours.” Researchers who go into the wild and observe animals in their natural environment, rather than observing contrived laboratory experiments, are more likely to recognize that animals do have a thought process. Safina draws on observations of animals to illustrate his case. Elephants in Amboseli National Park, Kenya; wolves in Yellowstone National Park, Wyoming; and killer whales in the Pacific Northwest provide dozens of examples of how “who” animals exhibit a theory of mind. Elephants, for example, communicate through a series of rumbles that span ten octaves, most of which humans cannot hear. Play a recording of a member of a herd and the other elephants will recognize the “words.” They demonstrate grief and they remember lost loved ones. Safina does not neglect the terrible story of the destruction of elephants and their habitats in connection with the slave and ivory trades. A personal anecdote supports Safina’s position that some animals exhibit what we would call human behavior. Our van had left our camp on the Serengeti Plains when we came upon an Alpha male baboon as he lay bleeding in the roadway, clearly taking his last breaths. The members of his pack were walking away reluctantly. They stopped and looked back. A couple of them came back to their leader to check on him. Clearly recognizing the inevitable, they rejoined their departing pack. It was heartrending to watch their body language as they decided to stay or leave. None of us could deny our clear recognition that these animals were recognizing a deep sense of loss and experiencing a profound grief that showed in their very facial expressions. One could almost imagine that tears streamed down their faces; they certainly did on ours. Carl Safina has written a valuable, thought-provoking book. He reminds us that we are the “flood” that endangers the existence of a species. The tone and style elevate this from the realm of dry textbooks into a pleasurable, brilliant opportunity to learn about animal behavior. Holding a Ph.D in ecology from Rutgers, his work has appeared in six previous books and articles in Audubon, The New York Times, and a host of other outlets.